Batman: Assault on Arkham is a 2014 direct-to-video animated superhero film that is part of the DC Universe Animated Original Movies. Jay Oliva and Ethan Spaulding direct, with a script by Heath Corson, and James Tucker producing. The film was screened at the 2014 San Diego Comic-Con International on July 25, 2014, and it was released digitally on July 29 and on physical media on August 12. The film is set in the universe of the Batman: Arkham video game franchise, occurring after Arkham Origins; Jay Oliva states it takes place about two years before Arkham Asylum. The story focuses primarily on the Suicide Squad, particularly Batman villains Deadshot and Harley Quinn with Batman in a supporting role. In the film, a Suicide Squad of six criminals is dispatched by Amanda Waller to break into Arkham Asylum, where they must contend with the asylum's inmates and Batman as they attempt to complete their mission. The film stars Kevin Conroy as Batman / Bruce Wayne (reprising his role as Batman from the DC animated universe, among other numerous DC properties, including the Arkham series), Neal McDonough as Deadshot / Floyd Lawton, Hynden Walch as Harley Quinn / Dr. Harleen Quinzel (who reprises her role from The Batman) and Matthew Gray Gubler as Riddler / Edward Nygma. In addition, Troy Baker, C. C. H. Pounder, Nolan North, and Martin Jarvis reprise their roles of Joker, Amanda Waller, Penguin / Oswald Cobblepot and Alfred Pennyworth from Arkham Origins (with North and Jarvis also appearing in Arkham City), while Jennifer Hale reprises her role of Killer Frost from the DCAU and other properties. Batman rescues Riddler from a black ops assassination ordered by A.R.G.U.S.' director Amanda Waller, returning him to Arkham Asylum. Invoking Priority Ultraviolet, Waller captures criminals Black Spider, Captain Boomerang, Deadshot, Harley Quinn, KGBeast, Killer Frost, and King Shark for the Suicide Squad. Their mission is to break into Arkham and recover a thumbdrive in the Riddler's cane. While in Waller's employ, Riddler copied information on the squad to make it public knowledge. She forces compliance by threatening to detonate nano-bombs implanted in their necks. KGBeast, who believes it's a bluff, walks out on Waller and is killed as an example to the others. The six are sent to Gotham City, where Penguin has been hired by Waller to give them arms, equipment, and a place to stay, although he is angry with Harley and Joker for tossing his cigarettes in the harbor for a laugh. Deadshot repeatedly clashes with Boomerang as the latter does not respect his leadership of the group. To get to Arkham, Harley breaks into a doll store and begins trashing it. Batman arrives, demanding she tell him where Joker hid a dirty bomb; Batman has been ransacking the city in search of it, even resorting to interrogating Riddler for answers. This is also a dead end, as Harley has no clue where the bomb is located; Batman is forced to send her back to Arkham. At Arkham, Harley encounters the Joker, who begins taunting how he previously kicked her out of a car, and ends up lashing out by attempting to shoot him with a stolen gun, only to fail in doing so due to the Joker's bulletproof prison cell. This distraction allows the others to infiltrate Arkham in disguises. Black Spider causes an explosion, putting the asylum on Yellow Alert; King Shark suggests playing the previous day's footage to keep both Batman and Waller from noticing them. Despite some in-fighting, the team manages to get to the storage room, where they find Harley's mallet and Riddler's cane, however they find the latter empty. Batman arrives, as the footage showed employees who had that day off, fighting the squad until Black Spider pins him during an explosion; Black Spider later emerges with Batman's belt as his trophy. However, they then notice Killer Frost is missing. It turns out Frost was tasked by Waller to kill Riddler, which was the true purpose of the mission; however, he reveals Waller can't kill him with a nano bomb for the very same reason she wants him dead: because he knows how to defuse it. The rest of the squad find her and Riddler outside the Medical Facility; they agree to help Riddler escape if he can defuse the bombs. Unfortunately, Joker also manages to escape as Harley's attack weakened his cell. Riddler hooks the squad up to the electro shock machine, minus Black Spider as he wishes to stand guard. At the same time, a dazed Batman wanders around and is found by the Joker, who sneaks up to shoot him. Riddler turns on the machine as Waller calls for an update; seeing the bombs' signals fading and learning of the squad's betrayal, she activates them. Harley, Deadshot, Boomerang and Frost survive, but King Shark's head explodes due to his thick skin blocking the electricity; oddly so does Batman's before Joker can shoot him. Riddler begins laughing as the squad hasn't figured out that "Black Spider" is Batman; revealing himself, Batman demands to know why the squad is in Arkham, only for the Joker to arrive and start shooting at everyone. Harley manages to sweet-talk the Joker into forgiving her, and Deadshot manages to "out-crazy" Joker to scare him away. It's then revealed Joker had hidden the dirty bomb in Harley's mallet, which he then activates. Joker broadcasts to Arkham, telling Batman and the squad that soon Gotham will be destroyed; he releases the inmates as a distraction to allow him to escape. Deadshot manages to escape in a helicopter, while Frost is presumably killed in the chaos by Bane, and Deadshot and Captain Boomerang battle for who escapes in the helicopter, with Deadshot tackling him out and leaving him to be arrested. Batman notices three heartbeats coming from the helicopter, realizing Joker and Harley stowed away. Some characters from the Arkham games appear in non-speaking cameos including Bane, Two-Face, and Poison Ivy. The soundtrack to Batman: Assault on Arkham was released on July 30, 2014, with music composed by Robert J. Kral. Scott Mendelson of Forbes roundly praised Assault on Arkham for its action, art style, humor, voices, and characters, calling it one of the best films of DC's direct-to-video lineup. He described it as a "gleefully immoral" heist film which, having "no real [plot] arc to speak of", relies on its violent action and clever character dynamics within the Suicide Squad to carry it. 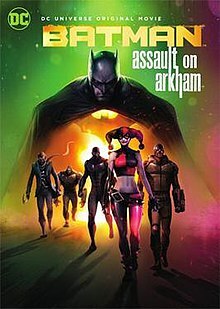 Due to its villainous protagonists, dark comedy, and sexual content, Mendelson considers the production of Assault on Arkham an experimental decision by DC, and a successful experiment as it tells a style of comic book story that would never get approval as a live-action project. Seth Robison of Newsarama was far more critical, considering the animation, characterization, and storytelling in the film poor. He had particular dislike for the voice acting, which he believed squandered a talented cast by delivering a "disjointed" performance, and for Assault on Arkham's interpretation of Amanda Waller, which he believed simplified her into merely another villain. He further found Deadshot's sympathetic characterization opaque to non-comic readers and Harley Quinn's crazy act obnoxious. Overall, Robison deemed the experience of the film "superficial" and thought it compared unfavorably to those offered by the Arkham video games and the Justice League Unlimited episode "Task Force X". It earned $4,883,333 in domestic home video sales. ^ Batman: Arkham Underworld reveals that Deadshot never pulled the trigger as Batman stopped him before he could decide to carry out Waller's assassination. ^ Gallagher, Brian (July 20, 2013). "COMIC-CON 2013: 'Son of the Batman' and 'Batman: Assault on Arkham' Announced for 2014". MovieWeb. Archived from the original on July 22, 2013. Retrieved May 5, 2014. ^ a b c d e "Warner Bros. Brings "Batman: Assault On Arkham" To DVD/Blu-Ray August 14". Comic Book Resources. May 7, 2014. Archived from the original on May 7, 2014. Retrieved May 7, 2014. ^ Sneider, Jeff (July 8, 2014). "Comic-Con: Warner Bros. Bringing Peter Jackson's 'Hobbit' Finale, 'Mad Max'". The Wrap. Archived from the original on July 18, 2014. Retrieved June 18, 2014. ^ Reiner, Andrew (May 16, 2014). "Batman: Arkham Assault Movie Releasing On Blu-Ray, DVD This Summer". Game Informer. GameStop. Archived from the original on May 16, 2014. Retrieved May 16, 2014. ^ a b c Vieira, Anthony (April 20, 2014). "'Batman: Assault on Arkham' Trailer – The Animated Movie Based on the 'Arkham' Games". ScreenRant. Archived from the original on April 19, 2014. Retrieved April 20, 2014. ^ Miereanu, Gary (June 4, 2014). "It's @HyndenIsHere voicing equal parts of crazy, vicious & hilarious as #HarleyQuinn in #BatmanAssaultonArkham pic.twitter.com/6AS74m3D3b". Twitter. ^ a b Miereanu, Gary (June 13, 2014). "@UniversoDC1 @DallasLKinard @TheJohnDiMaggio IMDB is incorrect. Also rightfully credit @jhaletweets as Killer Frost. #BatmanAssaultonArkham". Twitter. ^ Miereanu, Gary (July 17, 2014). ". @Android00154 Actually, @nolan_north does double duty in #BatmanAssaultonArkham as both KGBeast & Cobblepot in distinctly different accents". Twitter. ^ "Batman: Assault on Arkham - Music From The DC Universe Animated Movie". WaterTower Music. ^ Mendelson, Scott (August 6, 2014). "Review: 'Batman: Assault On Arkham' Is Among The Best DCAU Films Yet". Forbes.com. Archived from the original on August 9, 2014. Retrieved August 6, 2014. ^ Robison, Seth (July 31, 2014). "Batman: Assault on Arkham Review: Bat-Fans, Look Elsewhere for Your Arkham Fix". newsarama. Archived from the original on September 4, 2014. Retrieved August 9, 2014. ^ "Batman: Assault on Arkham (2014) The Numbers listing". The Numbers. Accessed 22 January 2017.